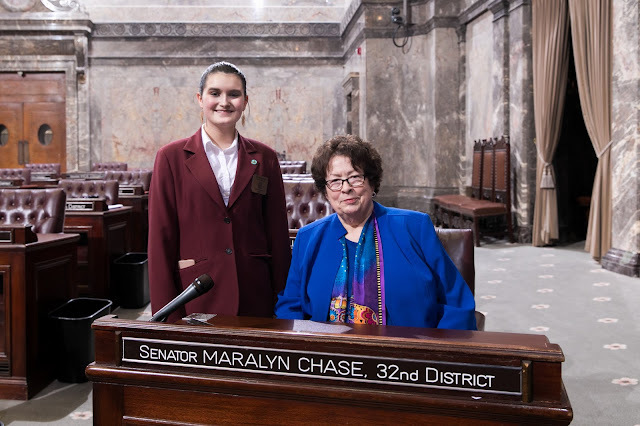 Serenity Healy, 14, served as a page in the Washington State Senate during the week of January 22, 2018. Pages are sponsored by the senator from their legislative district. Sen. Maralyn Chase, D–Edmonds, sponsored Healy’s week in the Legislature. “One of the best things I’ve done while I’ve been here is working in the Senate galleries,” said Healy. Healy is in 8th grade at St. Luke Shoreline. She enjoys participating in speech team and math club, as well as swimming, in her free time.